Can I get a cancellation? From LA Times, "'2 Broke Girls' and one ugly clash with reporters"
When the subject kept returning to Han Lee, King grew increasingly contentious. "I like Han and the fact that he's an immigrant," King said, adding that he didn't find the character offensive. King added that because he is gay — and a comedy writer — it gave him permission to poke fun at other "outsiders." I have many white gay friends who stand up for racial equality, most of them are younger than Michael Patrick King who seems to have maxed out his minority card. 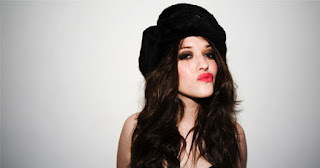 Kat Dennings is to gorgeous to be on such a racist show if you ask me. Her lips could save nations. At the very least her and Scarlet Johansson should go and make an action flick.